After eighteen months of planning, relaxed and intense all at the same time, our wedding went wonderfully. We tried to mix the Mexican details in with the very British setting of the grand but cosy Highbury Hall in Birmingham. These were some of my favourite parts – papel picado, tequila on every table, Mexican music and singing and dancing all night long! One of the first things we got excited about was the favours, little glittery matchboxes with Mexican lotería cards for decoration (a game a bit like Bingo). Daniel had seen them on Etsy and they were so lairy I loved them! Of course, in full-on money-saving mode I decided to make them myself. I took it slowly, starting them in July while I was off work, and finished them in February. By making them myself we paid about £40 for the eighty matchboxes. They were about £90 for 80 matchboxes so with postage from the US on top I basically saved a bomb. You could save even further by printing the lotería pictures out from Google Images onto card and filling them with sweets or little printed out notes. Measure your matchboxes and cut your glitter card with the guillotine. Our matchboxes were bright orange, so it was really important to get the sizing right so that it couldn’t be seen around any edges. You should also be able to measure the paper to get the best number of pieces out of it so there’s as little wastage as possible. As an exporter it reminded me of my CapePack days trying to work out the optimum cartons per pallet for transport. Also, cover your work surface with newspaper because the value card leaks glitter everywhere! Cut your lotería cards with the guillotine. Filter out those you don’t want, for example we took out El Negrito, and the ones with boring pictures like La Campana and La Mano (the Black Man, the Bell and the Hand). I also tried to get a good mix, there will be more Estrellas than Ranas for example (Stars and Frogs), so I did a bit of sorting and counting to get more or less even numbers of each design. Stick the glitter card to one face of the matchbox, once that side is dry glue a different colour to the other side and leave a couple of days to dry completely. Mine were left to dry next to a sunny window for about two days in the middle of Summer, then transferred to a Tupperware box with a sheet of kitchen roll between each layer. I checked them every three or four weeks to make sure that the glue was sticking and that they weren’t rolling up at the edges. 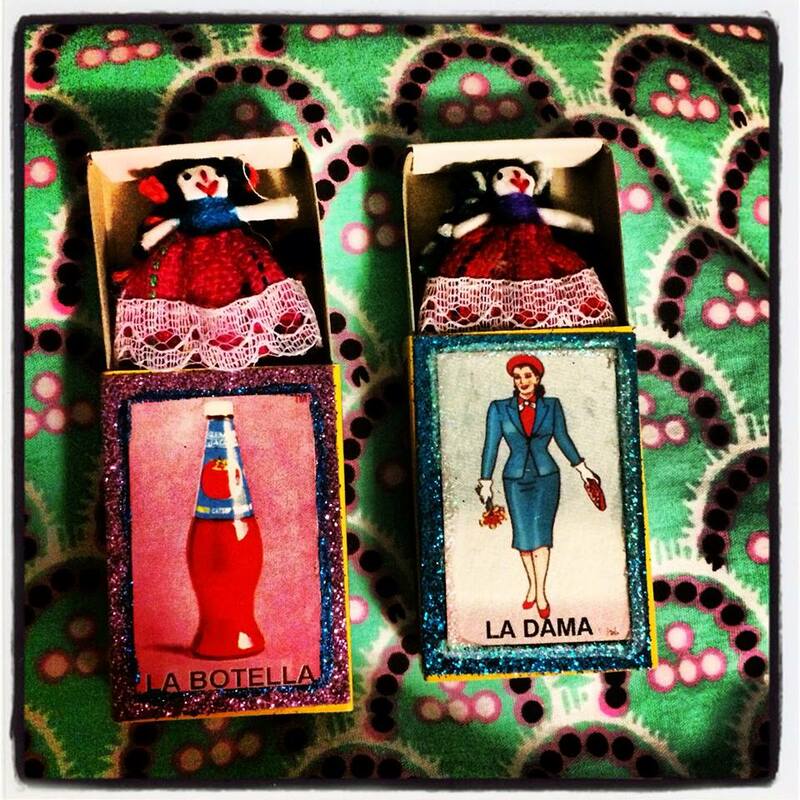 Glue the lotería pictures onto what will be the top of your matchboxes and leave to dry. I put my piles of pictures in order so that I used the most exciting pictures, like El Borracho and El Nopal (the Drunkard and the Cactus), and went along them in order. I also tried to get mine contrasting, I would not glue a picture with a yellow background on to a gold glitter side, or with pink background onto a red glitter side etc. These were left for two Wintry days to dry by my sunny window. Glitter glue around the outside of the lotería picture to hide the edges, leave to dry. I left mine one week at the sunny window in January, to be completely sure they were dry. Again I used contrasting colours, eg., gold glitter side with blue picture background with pink glitter glue / blue glitter side with yellow picture background with green glitter glue. Fill the matchboxes with all your goodies and enjoy your guests’ reaction to the colours and the little surprises inside! Day 77 – The 2014 World Cup in Brazil, marking the return of the Erasmus Fit List. Sitting with my Erasmus girls in the Irish Bar, or in the park or in the back row of our Historia del Arte Moderno class, we compiled a list of all the celebrities that we fancied. Every so often we try and add someone new to it. Day 79 – Feeling blue? Glitter Mariachi are playing for you! Day 80 – I saw this graffiti on my way to the pub to watch the England vs Uruguay game, after I’d stopped to call the Police for a drunken man passed out in the street. Doing my bit for society without voting UKIP. Day 81 – My friends got married, outside! It was a beautiful day! Day 82 – Putting the iPod on loud and having a sing-song in the car on the way home from the wedding. Day 83 – I cleaned my engagement ring, Being blue it does get dull very easily and in some lights it even looks black, so I cleaned it and had forgotten how shiny and brilliant it is! Note to self – do this more often! Day 63 – The King of Spain has abdicated, and the very dashing Felipe and the beautiful Letizia open a new chapter in the history of Spain. Day 64 – An early night! Finally! Day 65 – Last year the council made this part of the Birmingham Ring Road into a wildflower garden. I’m excited to see this year’s version. Day 66 – A juevebes, with Daniel in The Craven Arms. Day 68 – The first Hens at the Party, old friends enjoying all the pre-wedding fun. Day 69 – A new box-set to be getting on with, spelling a lazy Sunday! Day 28 – A lovely sit down in Gran Electrica in Brooklyn after a long but beautiful walk by the sea. Food was lovely but it was the sit down that really made me happy! Day 29 – The Staten Island Ferry is free, and a lovely way to see the city skyline and the Statue of Liberty from up close. I was happy that it was free! Day 30 – You already know that I’m rubbish with my hair, but today I managed to wear it in plaits, and they stayed in for most of the day! Day 31 – We move on to New Haven, so as I throw my Subway ticket away, I remember how lively it was. There were always people bustling about, and remembering the previous day where at 34th Street Station I was watching a boy solve a Rubiks Cube at lightening speed while a busker played The Beatles Here Comes The Sun while the rain pounded the streets above. Day 32 – Finally a sunny day! Perfect to explore Yale University. After the previous day’s pouring rain it was wonderful to have a walk around in the sun. Day 33 – This was the wedding of one of Daniel’s friends to his beautiful American fiancée. Daniel did the Best Man’s speech and absolutely nailed it! Every day he makes me so happy but after that I couldn’t stop smiling. Day 34 – A last look at Nueva Yorkcito before getting on the plane home. I’ve spoken so much more Spanish than English, and although the US is an English speaking country I’ve actually never visited it with English natives. For me I associate it only with speaking Spanish, and that much practice has made me very happy indeed. Day 14 – I went for a run – with my tree trunk legs – so the feeling of taking my shoes off afterwards was brilliant, followed by a hot shower. I really do need to get out there more. Day 15 – My car was being repaired so I had to get the bus to work. I’ve often said I’d like to work in the city centre and walk through the hustle and bustle every morning, and on Tuesday I did – and found the trees at the Peace Gardens full of blossom! Day 16 – We went for a little walk through town on Wednesday evening, to take photos that we’re hoping to use in our wedding. Here’s the library to show our lovely sunset walk through town! Day 17 – Calming stressed girls down since the dawn of time. A calm chocolate moment at lunchtime during a very stressed day at work. Day 18 – First day of the Bank Holiday weekend and we went to eat in the evening at a local Mexican place, Chilacas. They are finally getting the fact that Mexican is not just tacos and tequila, they now do Jarritas, and Guava is my absolute favourite so I was very happy to discover these in the UK. Day 19 – The buttonhole flowers from my sister’s wedding. We had an invitation to see them in Nottingham for viewing the wedding and honeymoon pictures. Cue making biscuits and getting very excited! Day 20 – The wedding photos, a lovely reminder of a beautiful day. My sister as per usual, messing with the technology until it’s perfect, nothing changes! A lovely lovely day of laughing and nostalgia. Day 1 : My Guides have been badgering me for ages about Rock Climbing, so I finally booked it for after Easter. Couldn’t wait to give them the letter and see their faces light up! Day 2 : Listening to the radio in the car, Danny Dyer’s version of “Selfie” by The Chainsmokers made my giggle all the way to work. Day 3 : We’ve been in our flat 8 weeks, and finally have curtains in the bedroom. Waiting for payday, and finally getting a decent night’s sleep made me happy on Thursday morning! Day 4 : I was invited to a Go Karting night with ex-colleagues from my old workplace. Lots of fun with familiar faces. Day 5 : We never take advantage of the market in Birmingham, so we went and bought all our meat for the next three months, and saved loads of money doing it! Day 6: The happiest day, knowing it is less than one year until the happiest day of our lives! January is an interesting month, it makes you think about what you’ve done in the past year, and what you want to do in the next. I’m going to be 31 this year, and I’ll be getting married when I’m 32. My Mom was something like 20 when she got married, and I know that times change – more university years, more careers, general attitudes to sexual freedom have changed so much – but I feel old doing this at this age. 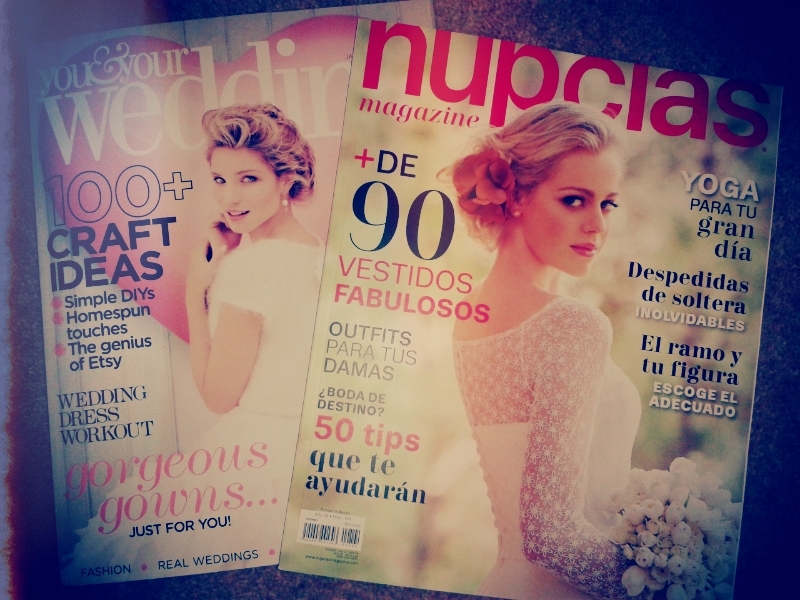 I bought a wedding magazine today, by accident. Haven’t opened it yet. The Mexican one was a mistake as well, waiting in the queue at the supermarket just flicking through, and before you know it it’s in the trolley! We’ve got potentially five weddings this year as a guest, all over the world (well, UK and USA). Everyone is more or less our age so it’s kind of the right time to do it. But I’m very, very aware of age creeping up. And if I didn’t want children I’d probably be OK with it. So right, this morning I was thinking about a Bucket List, or a Life Plan but I don’t even know what I’d put on it. I’ve bought a house and met the man I want to spend the rest of my life with, so then we get into the details. So here are some short, medium and long-term goals.